Comm Eye Health Vol. 18 No. 54 2005 pp 97. Published online 01 June 2005. Manager, International Programmes, Sight Savers International, Haywards Heath, UK. During a recent trip to Sierra Leone, cataract surgeons Ernest Challey and Edward Sandy explained what it meant to keep eye care work going during the nine years of civil war, which paralysed most public services in Sierra Leone. “We often had to sneak to work,” recalls Ernest Challey. Edward Sandy tells of evading the rebel troops to get to the eye unit at Connaught Hospital in central Freetown. During those years, with their colleagues, they tried to maintain eye care services, dealing with many trauma cases as a result of the fighting. Both men were inspired to study ophthalmic nursing when they saw the magic of sight restoration. In the 1980s they went to Tanzania for training, and then were posted to Mvumi Hospital, working with Dr Allen Foster. On return to Sierra Leone as qualified ophthalmic nurses, Edward Sandy was posted to the new eye unit, funded by Sight Savers International (SSI), at Bo Government Hospital, headed by Dr Dennis Williams. Ernest Challey joined them in Bo when Kenema, in the east, became too dangerous when war broke out in the beginning of the 1990s. As war intensified throughout the country, the team was forced to move to the capital, Freetown. There they found the disused eye unit at Connaught Hospital with broken equipment and in urgent need of renovation. For nine years the national eye care team functioned in these cramped and unsuitable premises, until SSI funded a new building, which now houses not only the Department of Ophthalmology, but also the National Eye Care Secretariat, and the SSI Country Office. During the war years, they both trained as cataract surgeons with Dr Moses Chirambo in Malawi, followed by an internship in The Gambia. Their families remained behind in Bo and regular contact became impossible – at one point Ernest Challey’s family had to flee to the bush when rebels attacked, and contact was temporarily lost. The two men, now senior ophthalmic medical assistants and cataract surgeons, are the backbone of cataract surgery in the country. Today, Edward Sandy is responsible for the Southern Regional Eye Care Programme and Ernest Challey is in the Department of Ophthalmology in Connaught Hospital, Freetown. 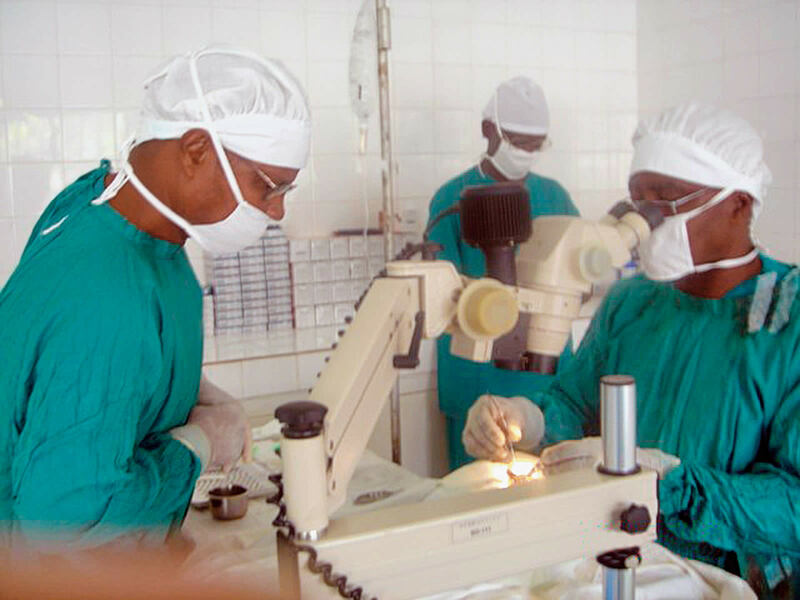 With stability restored in Sierra Leone, they are able to look ahead to expanding eye care services in the country. Ernest Challey would like to contribute further by training others, especially as Sierra Leone is planning an ophthalmic nurse training course. Edward Sandy hopes to see the Eye Care Programme in the southern region expand to ensure that every district hospital has one ophthalmic nurse, providing immediate care as well as identifying cases for surgery. It will be many years before Africa has its full quota of ophthalmologists. Well-trained and experienced cataract surgeons like Ernest Challey and Edward Sandy are proving their value, by restoring sight to those who might otherwise remain blind, and by sharing their experience acquired during difficult times.